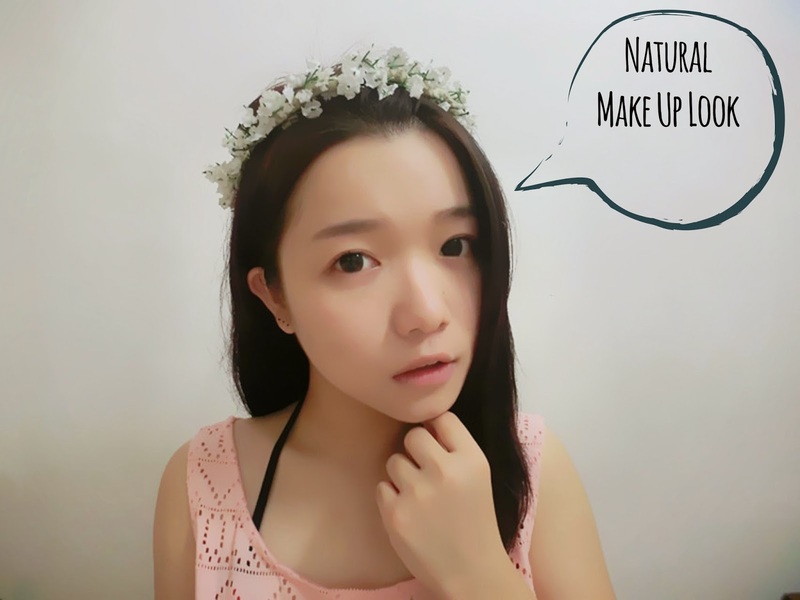 Amelie's Blog : Daily Natural Make Up Look. In this post, I am going to share my daily make up routine. It will be super natural, no worries. I know how hard it was bearing 10kg of skin care and make up products on the face. I used to be that way for the past few years. Now, here's the time for a light makeup in just 3 simple steps using recent well-known make up products which highly recommended by blogger world widely and all the products come with unique features! After cleansing your face, go on with your skincare routine, then BB/CC Cream. Hereby, I am applying L'EGERE Aqua Soothing Essence-In CC Cream. BB/CC Cream can improve skin texture and cover up flaws on face, like dark circle and red blemishes. Besides, even up skin tone and brighten up dull skin. Both has minor difference in coverage level, yet the main difference is CC cream has skincare ingredients within but nope for BB cream. L'EGERE Aqua Soothing Essence-In CC Cream SPF 20 is a CC cream from Korea. It provides super moisturize level with visible water drops effect using W.S.N. Technology. Using the innovative formula, it contains natural moisture and soothing ingredients, leaving us with hydrate and soothing skin instantly. Besides, it primes and even up skin tone, giving our skin a radiant and silky finish. To fully cover up dark circles or blemishes, use 'tap' technique and apply few layers around the area where you would like to cover. Q&A: What I think about it? Since the texture is in 'dilute liquid form' of cream, unlike what we used out there as they are more concentrated, it appears to be not too sticky and still perfectly cover the flaws on my skin (shown on picture above). 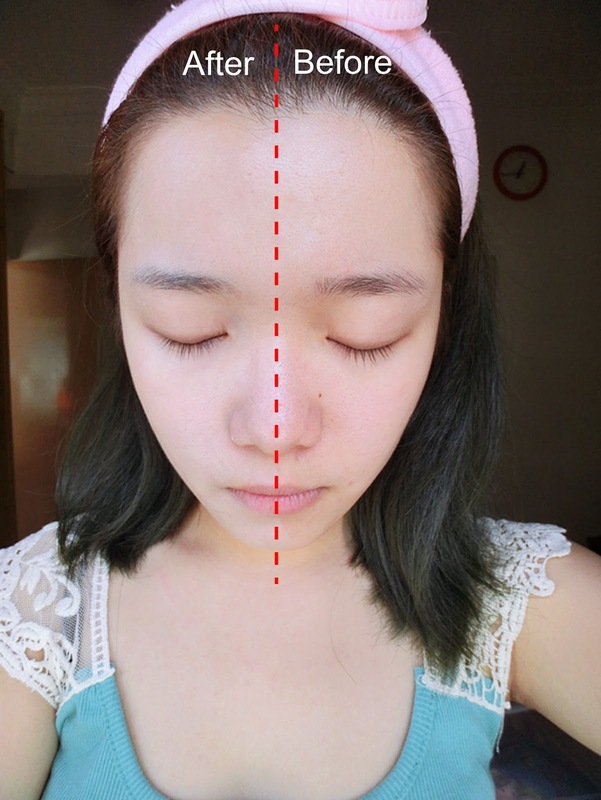 With its skin tone color, my skin appears to be more natural and light after the application. Besides, my skin look more radiant and smooth, no more worries for uneven skin tone, dark circle, big pores and even blemishes. As it's in dilute liquid form, I can instantly feel it's moisture level on the skin after applying it. I love how the bubbles are formed, it was really amazing and best describe its aqua characteristic. I have never seen any BB/CC cream can form bubbles that way so far. 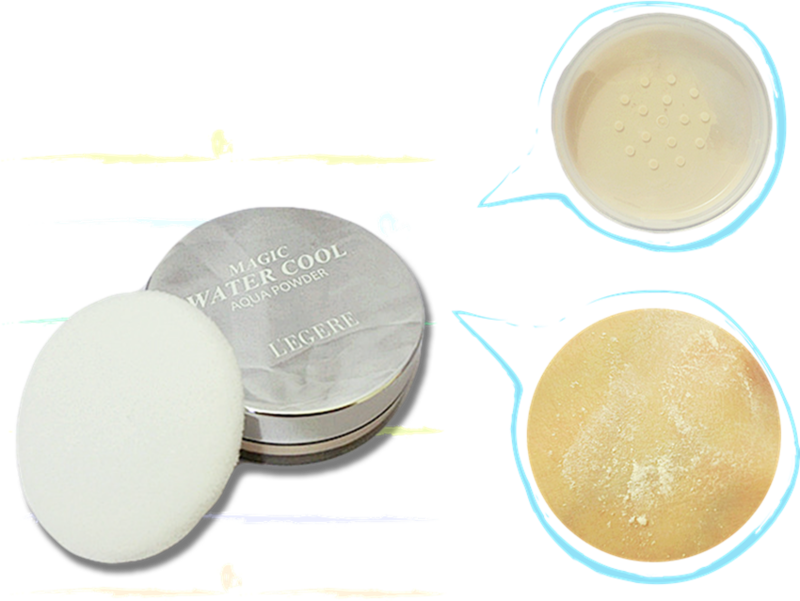 After CC cream, hereby I have put on L'EGERE Magic Water Cool Aqua Powder as my setting powder. Setting powder is a must so that our overall make up can last longer and reduce the stickiness on skin, leaving us with silky smooth baby skin. 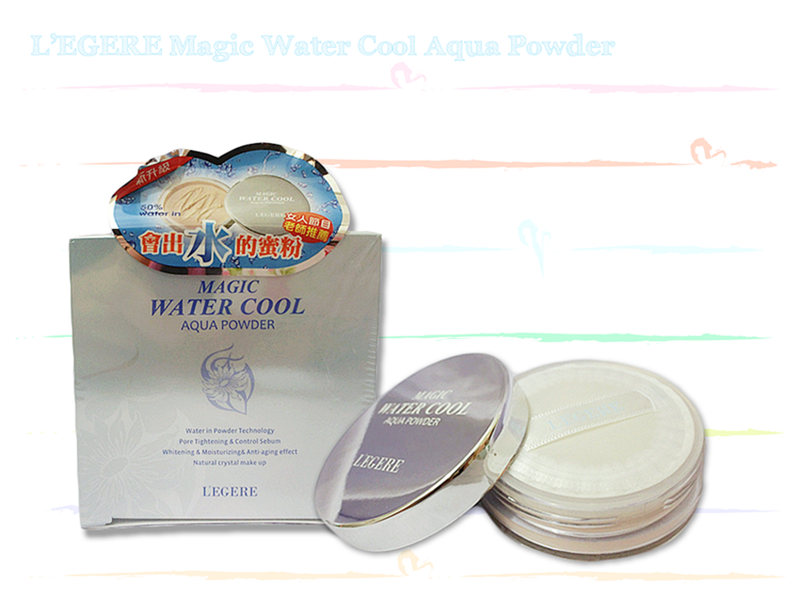 L'EGERE Magic Water Cool Aqua Powder from Korea, is a magic powder which creates natural crystal make up. It is a powder but water in powder around 60% and you can feel cooling touch upon applying. It can tighten pores and maintain fine finish resisting sweat and sebum. Meanwhile, it moisture and consist of anti-aging effect! After the application, powder instantly turn into water soothing molecules, giving our skin a brand new experience! This powder double up the moisturizing effects and keeping our make up in shape! The water soothing effect instantly tighten the skin and pores. Dark pigment can be effectively restrained with AA2G whitening ingredients in this powder, leaving us with rosy-fairness. The natural tea leaf extract effectively keep our skin away from oxidation. The ultra fine powders perfectly embellish small wrinkles, pores and imperfections, leaving us with bright and crystal clear glowy skin! It comes with an extra puff. The holes of the container are well-sealed with transparent sticker. The powder molecules are very fine and smooth. It's in light beige color. Apply few layers of powder under the eyes to prevent smudge/smear. I love that the powder is really fine and it do perfectly create a natural look which makes me look like totally not applying any make up on the skin. 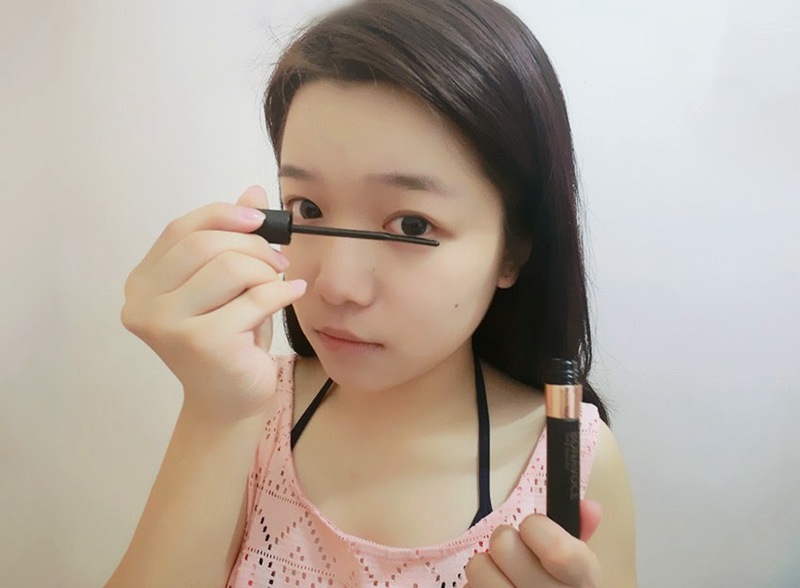 The water-patented technology is really awesome as when I was applying, I can feel water coming out and giving me much cooling effect! I can feel my skin being hydrated instantly. Moreover, it's easy in application and the powder closely attached to the skin without looking like applying 'a layer of powder' after the application. So flawless and natural! 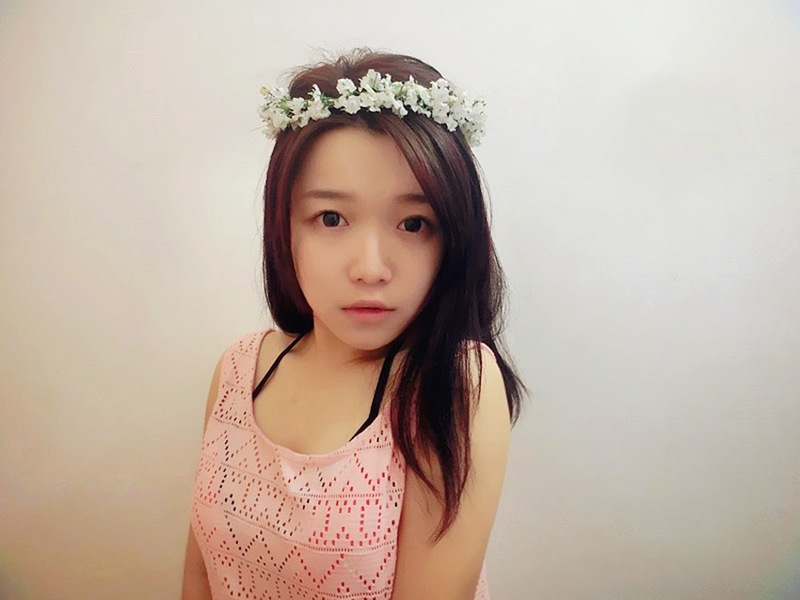 Best creating a Korean style make up. After the base, it's time for a little sparkle on eyes! That's mascara! For daily natural make up look, or even my daily outing, I do not apply any eyeliner or eyeshadow, but only mascara. You will see how's the huge different even only applying mascara with the condition that 'you found the right mascara'! 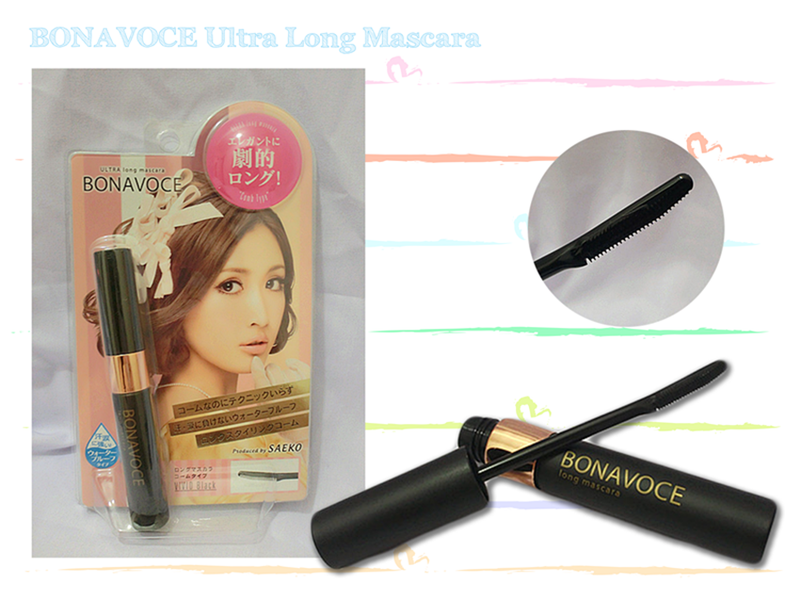 Hereby I am using BONAVOCE Ultra Long Mascara in Vivid Black from Japan. It has a long comb which especially designed to comb lashes from roots, it firmly catches short and thin lashes. Besides, it is formulated with 'triple block' polymer which promote effective water-resistance. 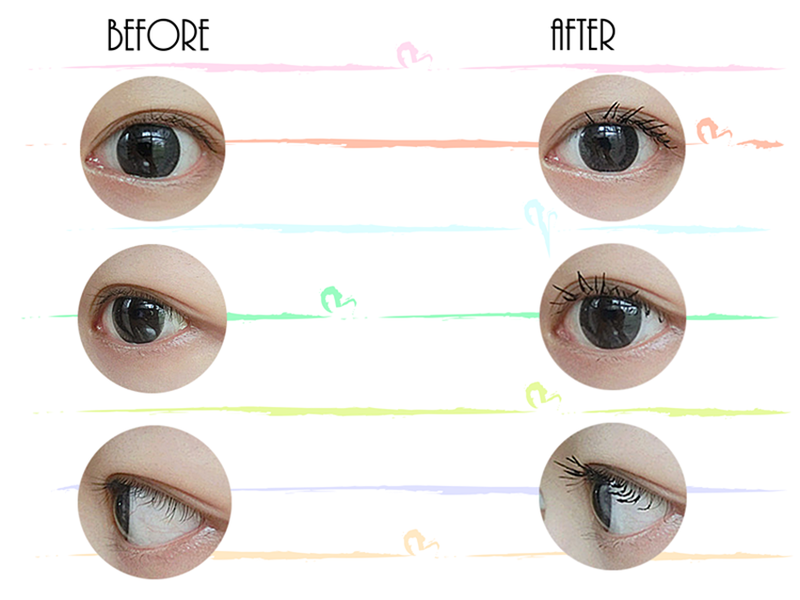 The adhesive film effectively resists water and sebum, preventing mascara from creating panda eyes. Get in a pool or ocean without having mascara running down your face! Here's the before and after the application of mascara. Clearly shown on every angle that my lashes are much longer and curl, without any clumps. No worries for multiple layers of it. Apply few layers to get longer and dramatic lashes! This is fabulous as you seen from the picture above! Every single lashes are clearly shown and combed without clumpiness. The ultra long effect are great and it last really well. I used to apply for my mom and the curl of the lashes last till the second day (my mom do not have the habit of removing make up at night). After all, get your brows done. Hereby, I am having my usual straight brows and tadaaaa, I'm done! Perhaps you guys love this natural make up and get up-to-date with all these unique inventions!. 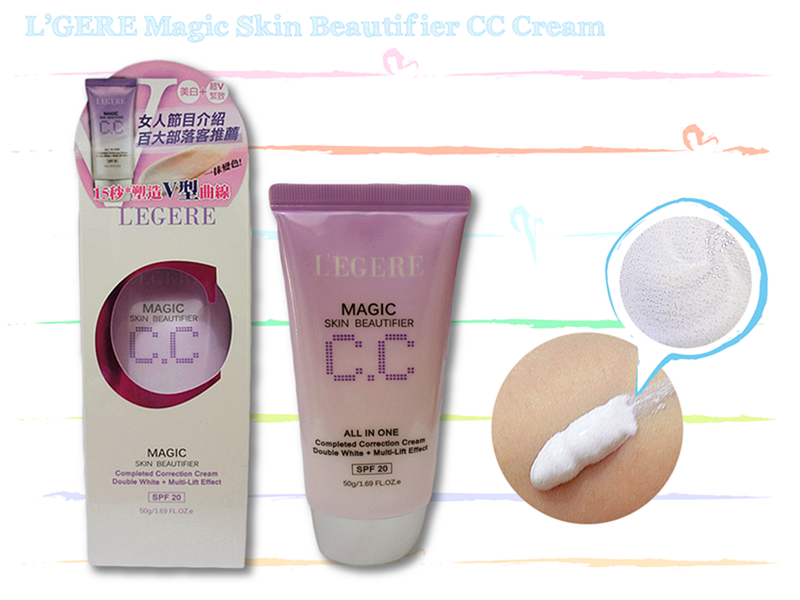 Last but not least, I would love to introduce L'EGERE Magic Skin Beautifier CC Cream SPF20 here. It is a all-in-one completed correction cream. With its capsule technology that keeps the exclusive CC capsule fresh until application, so that you can get the most translucent complexion. Moist milky-white cream. The texture is in cream form which is much diluted compare to Aqua Soothing Essence-In CC Cream SPF 20, it consists of tiny capsules within. 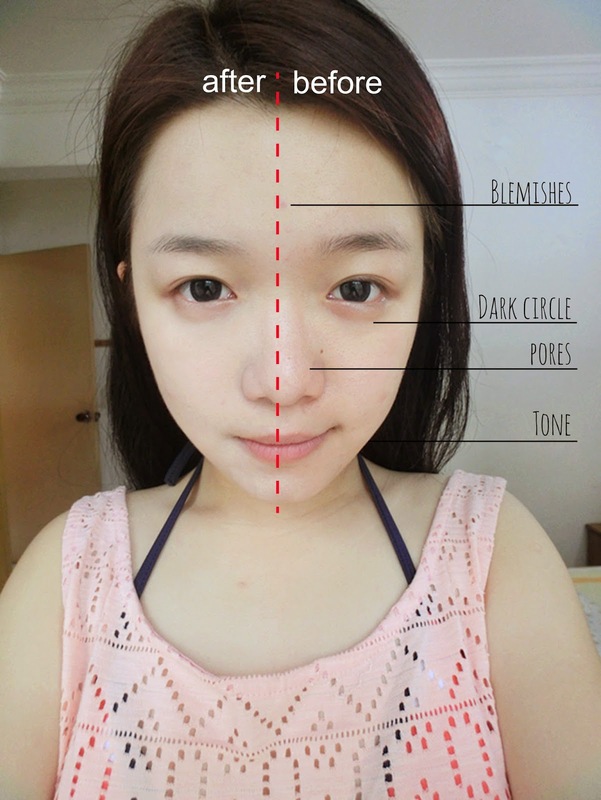 The coverage level is not that high as dark circle and pores still can be clearly seen. Whitening effect is fantastic, yet I found it too fair for me. I look pale after applying this. All these products are available on HiShop!